Amanda Stanton was arrested very early morning in Las Vegas on a battery domestic violence charge. According to the Las Vegas Metropolitan Police Department, the 28-year-old former Bachelor suitor and Bachelor in Paradise contestant was taken into custody around 3:15 a.m. due to an alleged altercation between her and her boyfriend, Bobby Jacobs. Insiders tell TMZ that Stanton was drinking late into the night as part of a co-ed bachelorette party. The gathering, which included Jacobs, ended up in a hotel room after the group had been out and about for hours beforehand. Law enforcement tell the aforementioned celebrity gossip website that security arrived at the room at one point in response to a noise complaint. Jacobs was reportedly talking to a guard when Stanton (who was far from sober) attempted to intervene and shoved her boyfriend in the process. This is why the security guard called the police. Stanton was charged with misdemeanor domestic violence and was released later on Monday. Sources say, however, that she and Jacobs are still together and on perfectly fine terms. They both think someone slipped something into Amanda’s drink, which prompted her to act in this unusually violent manner. 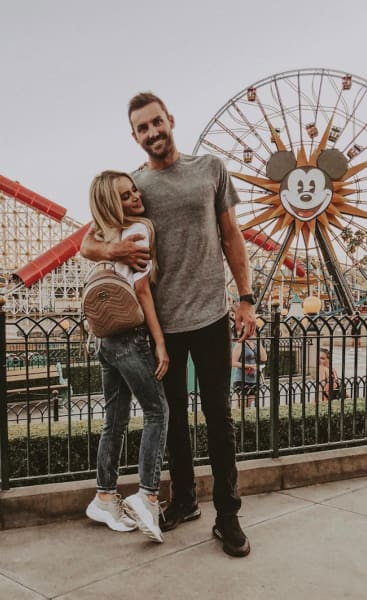 The veteran ABC personality – who appeared on season 20 of The Bachelor and seasons 3 and 4 of Bachelor in Paradise – was in Sin City for a bachelorette party with friends, including fellow Bachelor contestant Lauren Bushnell. The mother of two actually agreed to marry Josh Murray at one point, only for that romance to end in December of 2016. She also briefly dated Bachelor in Paradise Season 4 star Robby Hayes, and was mentioned on the program just last night after Hayes made a surprise appearance on Season 5. Almost immediately, a male contestant warned the women on the island that Hayes had supposedly cheated in Stanton, an allegation he has denied. As an actress, Stanton has appeared in The Cheetah Girls 2 and Merry Christmas, Drake & Josh. “We don’t really have a great story. Anthony Scaramucci: Fired as White House Communications Director! Already! Jackson Roloff Turns One! What Can He Do Now?!? Previous story Pauly D: Aubrey O’Day Is Almost as Crazy as Ronnie’s Baby Mama!